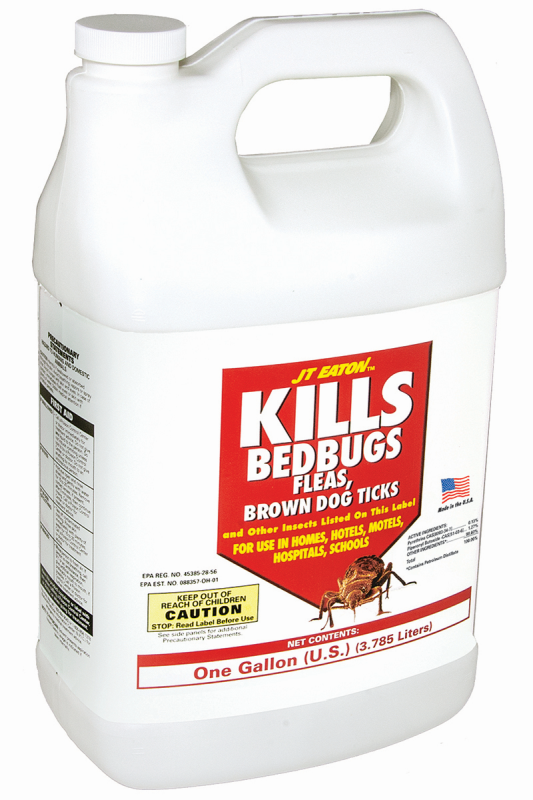 The JT Eaton 204-O/CAP Oil Based Bedbug Spray is a ready to use liquid with sprayer attachments to kill bed bugs, fleas, brown dog ticks and other insects. Simply spray on the infected area and the bedbugs will begin to die off. The active ingredients are Pyrethrin (0.13-percent) and Piperonyl Butoxide (1.27-percent) which effectively kills bedbugs and other insects without leaving residuals. This product comes in a 1-quart sprayer. The JT Eaton 204-O/CAP Oil Based Bedbug Spray comes with a 1-year limited warranty to protect against defects in material and workmanship. JT Eaton's mission is to manufacture and distribute products designed to eradicate pests. We continually seek out new ways to provide consumers with the knowledge and products they need to create a healthier and safer world. JT Eaton has been family owned and operated since 1932 and they manufacture and sell only the highest quality products.